Educators can use this graphic as an opportunity to discuss why the melting of floating sea ice does not contribute to sea level rise. Suggest downloading the In Dead Water report http://www.grida.no/publications/rr/in-dead-water/ to complement the use of the this graphic. The chapter on Sea Level Rise, page 32 of the report, provides additional background on the graphic, as well as other graphics to supplement not only sea level change but other topics relating to a unit on climate change issues. Be sure that the title and years are made clear to students. This visualization from the IPCC Fourth Assessment shows the estimated contributions of the two main sources for sea-level rise: 1) thermal expansion of ocean waters as they warm and 2) increase in the ocean mass principally from land-based sources of ice -- glaciers and ice caps and the ice sheets of Greenland and Antarctica. 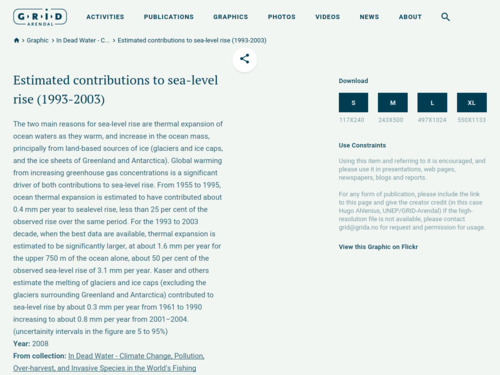 The estimated contributions are compared to observed sea level rise 1993-2003. Resource provides a clear sense of the relative contributions to sea level rise and the comparison between estimated and observed sea level rise. The graphics can be downloaded in a number of formats. Visualization can be enlarged easily, downloaded, and clearly displays the data well enough for students to understand themselves.